In a microwave-safe bowl, combine the cubed chicken breast, cream cheese and butter. Microwave in 20 second increments until the cream cheese and butter soften, and you are able to stir the mixture together to form a creamy sauce. Unroll both cans of crescent roll dough, and separate into 8 rectangles (4 per can). On an ungreased baking sheet or pizza stone, arrange the rectangles in a ring so that they form a 4-inch circle in center (dough will overlap). 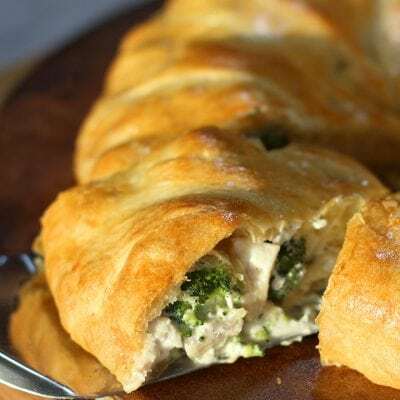 Spoon the chicken and cream cheese mixture around the center of the dough ring. Top with broccoli florets. Fold the end of each rectangle up and over the filling, tucking the top dough under the bottom layer of dough to secure it. Repeat around ring until entire filling is enclosed. Bake for 20-30 minutes until the dough is golden brown and thoroughly baked.